Use organic soybeans if possible. To cut the soaking time of the beans in half use hot water. I do not recommend using store-bought soy milk. Some of the milks have stabilizer and preservatives which prevent the milk from separating into the curds and liquid whey. 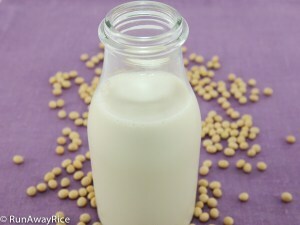 If fresh soy milk is available, you can start with this instead of making your own from the soy beans. Simply add 2 cups water to the milk and follow the remaining instructions. 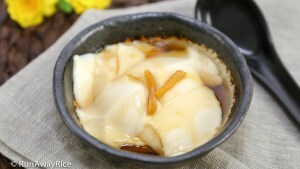 I use distilled white vinegar with an acidity of 5%. You can substitute the vinegar for the same amount of lemon or lime juice but you will have to use more of the coagulant to get the separation. Cheesecloth comes in different grades. I am using a double layer of grade 90 cheesecloth. The grade 60 cheesecloth, commonly sold at the grocery stores, will work just fine too. Make sure the heat is Low when adding the coagulant. Do not allow the milk boil or this will break up the curds. If after adding 1/2 cup + 3 Tbsp coagulant you still don’t see the separation, continue adding 1 Tbsp and letting it rest for 3 minutes. Repeat this process until you see the separation. Soaking the tofu in ice water helps to firm up the tofu. If you prefer a soft tofu, you can skip this step. 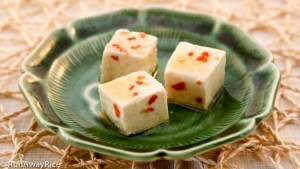 If not using right away, store the tofu immersed in water in the refrigerator. Change the water daily to keep it fresh. 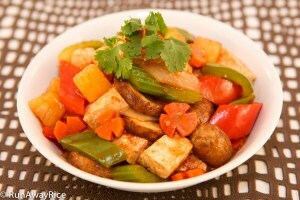 The tofu is best consumed within 1 week. Sift through the dry soy beans and remove any which are mis-shapened or covered with dark spots and discard. Wash the soybeans by swirling around in cold water for 1 minute and then pouring off the cloudy water. Repeat this process 2 more times making sure the final wash water is clear. Soak the beans in cold water for 8 hours or overnight. Wash the beans one more time and then drain well. Transfer the soybeans into a blender. Add 2 1/2 cups water. Starting first on Low speed, gradually increase to High speed. Blend for 1 minute. Add another 2 1/2 cups water and continue blending on High speed for another 30 seconds. Pour the soy milk into a nut milk bag. Firmly squeeze the bag extracting the soy milk into a large bowl. Pour the soy milk into a large saucepan. Transfer the soy pulp back into the blender. Add 5 cups water. Blend on High speed for 30 seconds. Again pour into the nut milk bag, extract the milk and then pour into the saucepan. Make the coagulant by combining 1 cup water with the 2 Tbsp distilled white vinegar. Set aside for now. Cut a double layer of cheesecloth to fit the tofu mold. Wet the cheesecloth and then wring out the water. Line the tofu mold with the cheesecloth. Invert a small bowl or dish inside a large dish or pan. Place the tofu mold on top. Warm the soy milk over Medium Low heat. Stir frequently to prevent the milk from burning on the bottom. Skim off the foam and discard. When the milk comes to a gentle boil, reduce the heat to Low and simmer for 10 minutes. Reduce the heat to Low. Quickly stir the soy milk a few times to get it swirling. Slowly Add 1/2 cup + 2 Tbsp coagulant by drizzling it into the soy milk. (You should see bubbles forming and the milk starting to curdle.) Stir gently in a back and forth motion to distribute the coagulant. (Small curds should be visible in the milk now.) Let the mixture rest for 5 minutes. Check to see if the liquid has separated into curds and liquid whey. If it has not, drizzle in another 1 Tbsp coagulant and stir gently. Let rest for another 3-4 minutes. The milk liquid should separate into curds and an opaque liquid (liquid whey). Using a slotted spoon, transfer just the curds into the tofu mold. Use a spatula to evenly distribute the curds into the mold. Fold the cheesecloth covering up the tofu. Add the lid and place a weight on top. 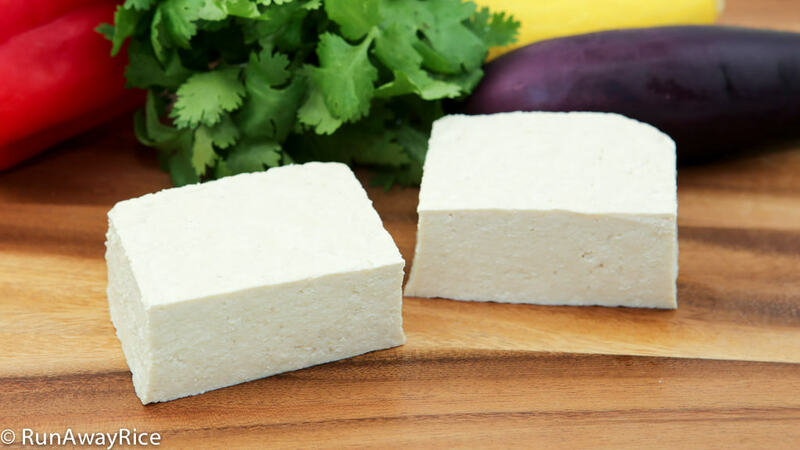 Allow the tofu to be pressed for 20 minutes. Fill a large bowl with ice water. Invert the tofu into the cold water and remove the mold. Unwrap the tofu and remove the cheesecloth. Allow the tofu to rest in the ice water for 15 minutes. 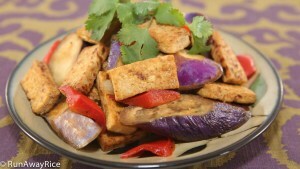 Enjoy the tofu fresh or as an ingredient in your favorite dishes. 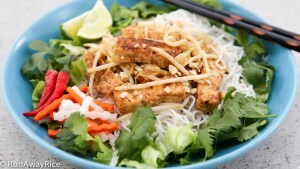 Hi Trang , I make tofu with nigari but I’m looking fr the flavorful tofu I ate when I visited Vietnam. 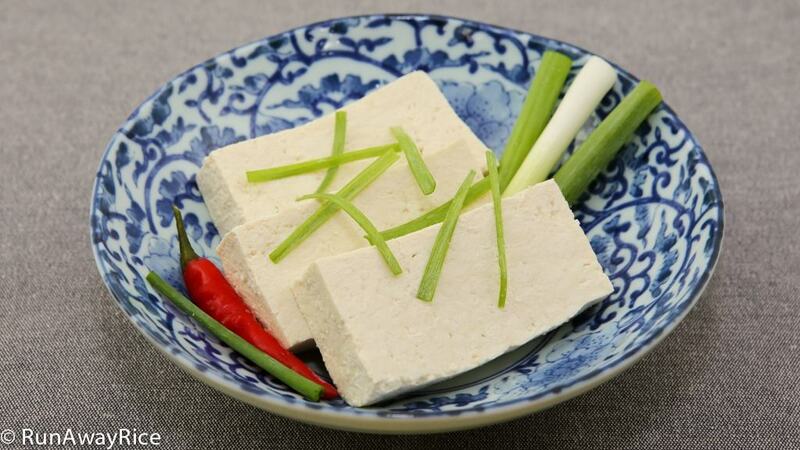 After reading various articles I understand Vietnamese tofu is made from whey from previous batches.im trying to understand if the distilled vinegar would give same taste or how much of soy whey I should use.the temperature over here is 35 degrees centigrade. It’s worth a try. If using the whey from previous batches, the process is the same as using the distilled vinegar coagulant. Start with 1/2 cup whey and drizzle into the soy milk. Let the mixture rest for 5 minutes. Check to see if the liquid has separated into curds and liquid whey. If no separation, drizzle in more and stir gently. Let rest for another 3-4 minutes and continue as needed. Good Luck and let me know how it works outs for you! 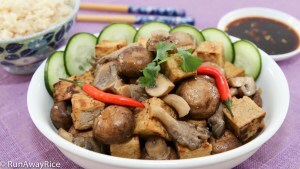 For the tofu with ginger syrup, you need to use a different coauglant. This recipe is on the list for upcoming videos. Please stay tuned! Hi there Trang. I went to check if I could find some asian products from the asian (Chinese, but they do stock other asian products) stores in my area. I failed explaining to people what I wanted… I was looking for Rice Koji, or the mould (aspergillus oryzae) used to make many asian (not only Japanese/Chinese) foods. There are many different types of moulds I wouldn’t mind experimenting with! PS: today I bought “diakon” radish seed, aka “Japanese radish”; but I learned about it from Thai, Chinese, Japanes, Korean, Philippenes food videos. Hi Trang! This is amazing detail video:). Will try . Your cooking technique is so easy to follow. Thanks again . Have a great weekend. Thanks so much! 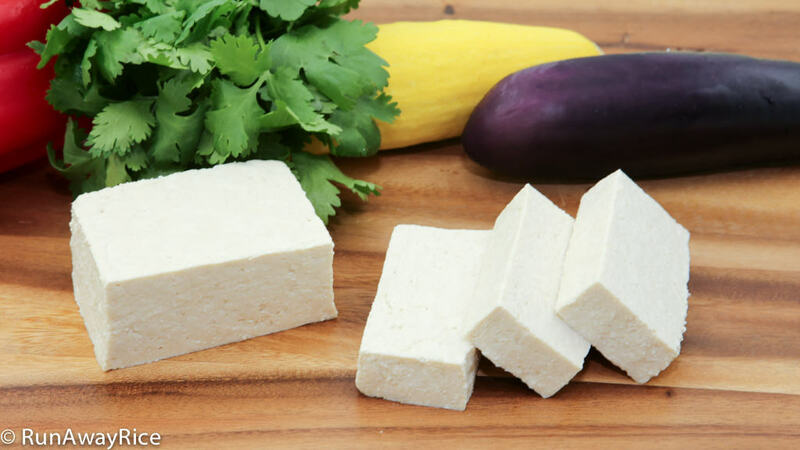 Enjoy making tofu. It’s really easy and I think you’ll love how it tastes!